This wonderful bass was picked up at Carvin's Covina, CA store in September 2003. It was another showroom queen at a bargain price. I knew I was in trouble when the manager threw a quote at me... and my wife confirmed it when I brought it in the door. This bass appears to be a 2003 model, but it could have been made earlier. The 5-piece neck is primarily hard rock maple with walnut stringers. The body wings are eastern U.S. walnut. The 24-fret ebony fingerboard has no inlays other than marker dots on the left (up) edge of the board, where only the player can see them. And the gold hardware adds a touch of elegance. Carvin's standard J99 single-coil neck pickup was barely adequate in this bass. Not long after the BB followed me home, I replaced the J99 with a Bill Lawrence J-45L. The J-45 is a significant improvement over the J99 in almost every respect (a slight susceptibility to electrostatic buzz being the only exception). The bridge pickup is Carvin's HB6 humbucker with a coil-splitter switch. When split, the single coil is reverse wound, reverse magnetic polarity to cancel hum with the neck pickup; it has a little more growl than a J-style pickup. With both coils on, it really snarls! The electronics are Carvin's current 18V "P Series" active/passive type. Piezo pickups in the bridge detect a more "acoustic" kind of tone, which can be blended with the magnetic pickups. In the event of battery failure, simply pull up on the volume knob and you have a passive bass with just the magnetic pickups. 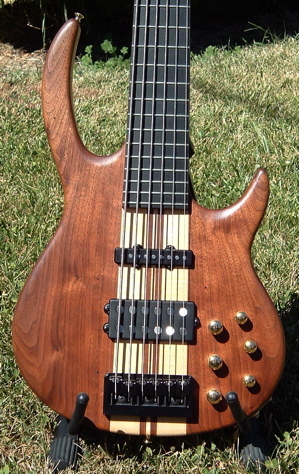 Like all Carvins, the neck is relatively thin front-to-back, and narrow for a 6-string bass. The long upper horn of the Bunny Brunel signature series basses helps reduce, but not eliminate, neck dive. It is quite a bit better balanced than the LB76 was, but it is also quite a bit heavier! With all that mass, the low B is very solid. I have found only minor dead spots on the neck. The P Series electronics offer a huge variety of tones. Even with the dead strings that were on it in the showroom it sounded great. And with a fresh set of Carvin's private-label nickel roundwounds, it sounds awesome! Gold hardware sets off the deep walnut grain. No surprises in the view of the back, just more walnut! Maple/walnut BB76P / http://www.chucko.com/Carvin/BB76P.html / Copyright © 2004 Chuck Fry / All rights reserved.